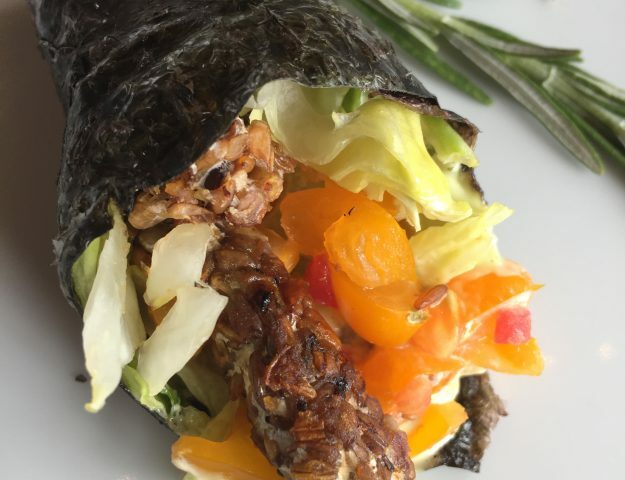 I had never heard of koji until I met Laci Ulrich. 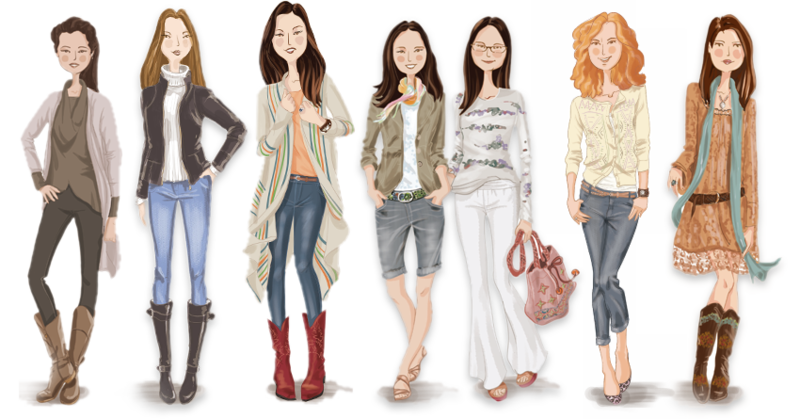 Laci is a talented, petite, beautiful ball of quiet energy and passion – kind of zen like – like the Japanese. 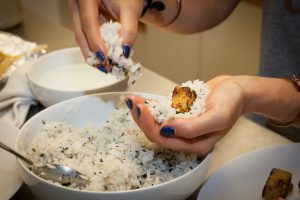 She lived in Japan for a year and learned the ancient technique of fermenting koji. It is one of Laci’s many specialties, so I was really excited for this photoshoot. 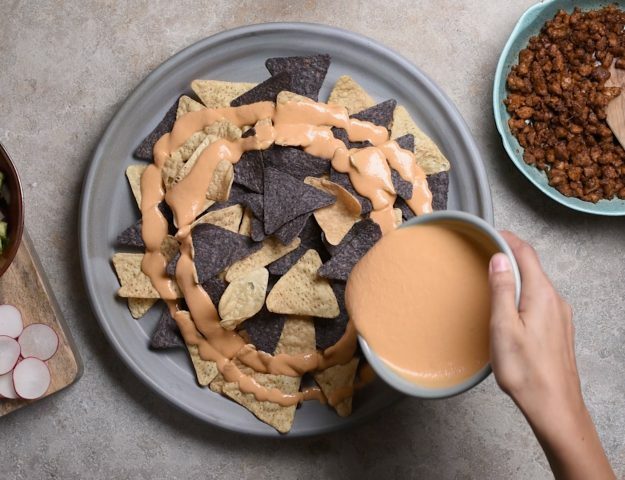 Laci and I have something in common – we both cook with our senses and rarely write down recipes so I will be extra aware as I share this recipe! 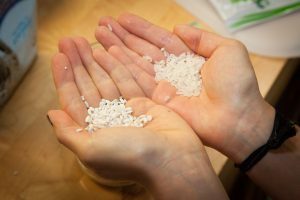 I have to say, I am now in love with koji which is a fermented rice as well of having the honor of being the national mold of Japan! Does the U.S. have a national mold? I wonder! 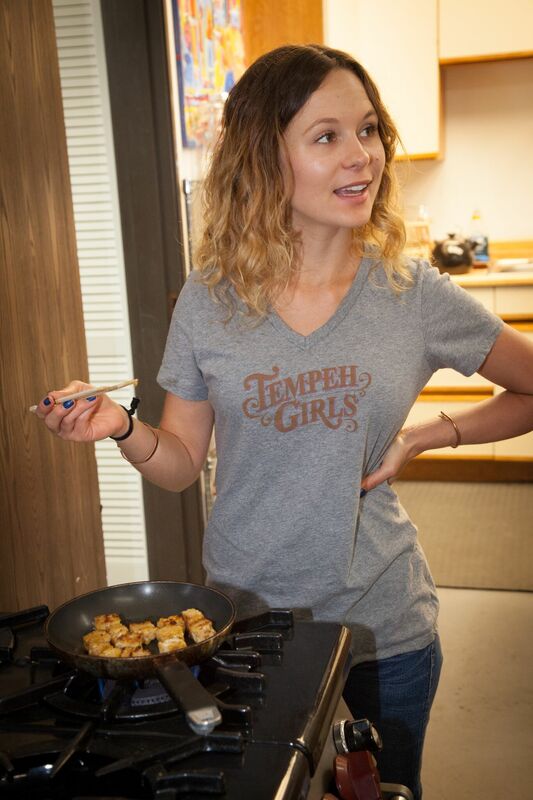 Laci explained that the koji brings out the umami, the savory, in everything. 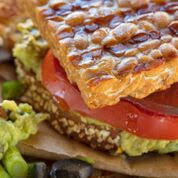 And, it breaks down protein, sugar and fat – sounds like a win to me! 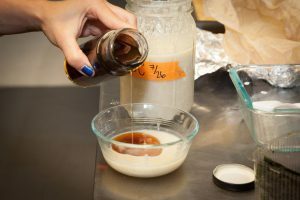 If you want to make this recipe, I recommend buying koji in an Asian store or using mirin as it has rice vinegar and koji in it – the process of making it is laborious! But I was gifted the home made koji in this recipe so I will explain both. It’s just 6 ingredients! 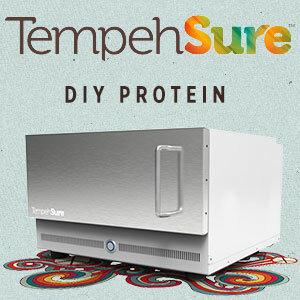 Tempeh – 8oz – channa dal tempeh was used with the TempehSure system – www.tempehsure.com – but any tempeh will do! First rinse the rice – this removes the starch so it is not so sticky. Then cook up the 1 cup of dry rice – this should make about 4 cups. 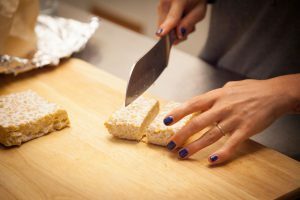 Chop the tempeh into 1 inch squares. Mix up the marinade of 1/4 cup koji (or mirin) and 1/4 cup toasted sesame oil – whisk it in a bowl until it is mixed in. Heat a pan – I like the non-stick pans called Scanpan – they are non-toxic. 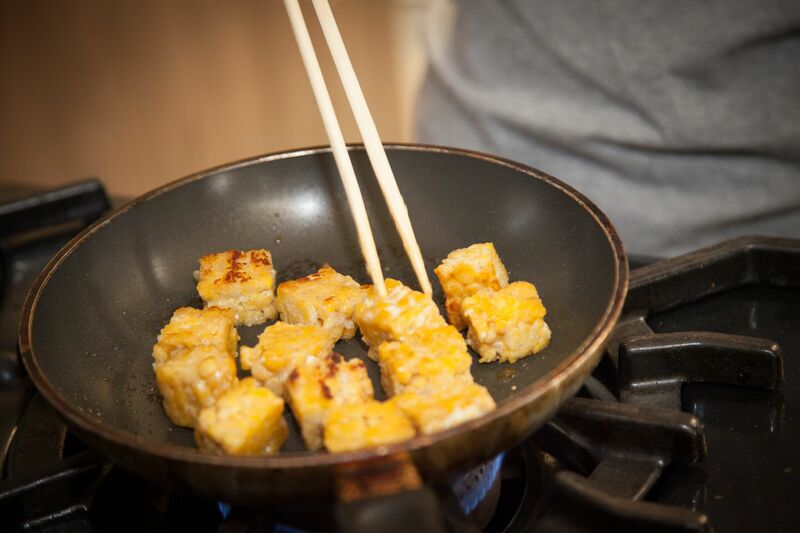 Dip the tempeh in the marinade and set in the pan – use chopsticks to turn the tempeh so it gets a little brown on each side. 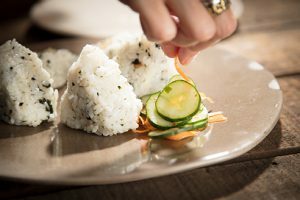 When the tempeh is done, dip your hand in water so the rice does not stick to it so much. Crunch up the roasted seaweed into the rice and mix. 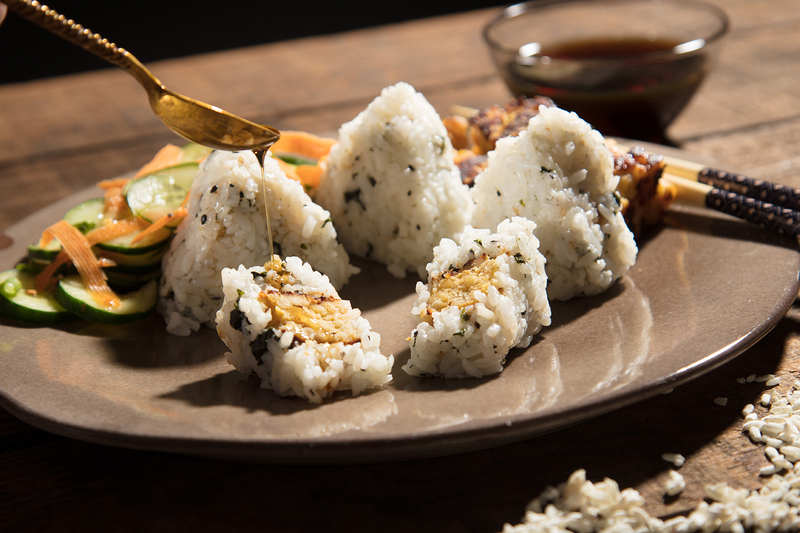 Form a rice ball around the koji tempeh and Voila!